Pickles: artichokes, aubergines, broccoli & Co.
Casa Iuorio is born from the willingness of ​​cultivating autochthone vegetables, typical of our territory: Valle del Sele. And the need to satisfy an increasing demand: healthy and natural food, made of few ingredients, simple and good, as we were children. Determined by this aspiration, we begun to transform the precious fruits of our land. Fragrant, genuine and very rich in nutrients, to offer the ancient flavours of our home. We arranged in the open countryside of Palomonte, in the province of Salerno a large, modern and well-equipped kitchen. Here we find new ideas every day, we adore creating not only preserves, but also pickles, sauces, creams, infusions. 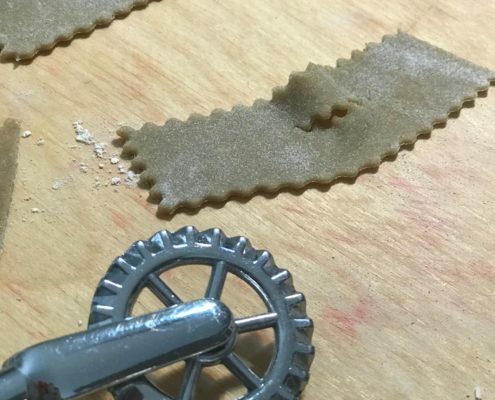 Our intent is to create a brand of excellent Italian food, which draws a visionary inspiration from the world of our grandparents and represents a point of reference for lovers of healthy and genuine food. With great determination we started to put together experience on experience, supported by study and discipline. Not only the studies and the masters but also the years spent abroad have given us an important knowledge. Our team is composed of Claudio, Anna and Mirella, all of us have the same dream: to compete at the highest levels, knowing that we have inimitable products. Claudio & Anna, both graduated in Foreign Languages ​​and with a long experience in the commercial field, especially in the export sector. 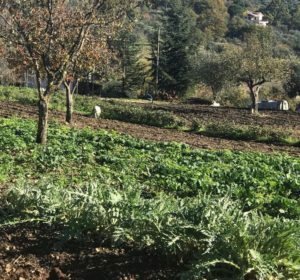 Claudio, lover of nature and passionate about agriculture, follows all the phases of the cultivation of the fields, helped by an expert agronomist. 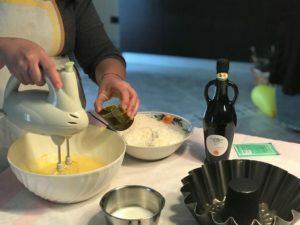 Anna, who grew up in an “Irpina” family, with a great passion for healthy food and good food, has always referred to this model, also to propose new recipes for Casa Iuorio’s pantry. Mirella, graduated in Environmental Sciences, always cultivates the desire to give substance to the protection of the territory, attracting the valorisation of her best products. The recipe for excellence? The preparation! Today it’s impossible to cultivate as 60 years ago or to reproduce the grandmother’s recipes equally. Thanks to the new knowledge many processes have been acquired and perfected thanks also to the collaboration with specialists from different sectors. The farmer regularly uses the collaboration of the agronomist to reduce/eliminate the use of pesticides and other chemical substances, while the food technologist has entered the kitchen to support us and allowing the traditional recipes to be preserved at their best in compliance with the best standards in order to guarantee food traceability, safety and quality. Our team has thus expanded with a trusted agronomist, a professional accredited by the Campania region, collaborating with the University of Salerno and with the CRAA – Center for Applied Research in Agriculture. And with a food technologist, a high level expert, already a consultant to other prestigious Italian food companies. This method allows us to improve our non-intensive productions, that are all processed by hand in compliance with all current regulations. Our products are known and appreciated not only in Europe (Switzerland, France, Germany, Sweden,) but also in the most distant and difficult markets, such as Asia and Middle East. 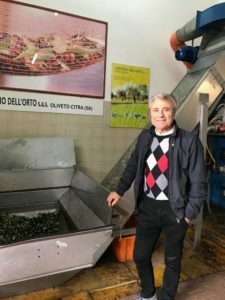 By now we know very well that when you deal with foreign markets you meet demanding and prepared customers, who know very well Italy and its food culture and have very specific requests. Our customers abroad do not just want to taste the product and know that it is good and that it satisfies his taste buds. 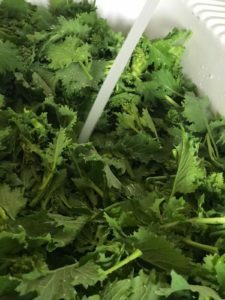 He also wants to have technical specifications of the product, know the nutritional values, as well as the sensory analysis and many other information that we must be ready to provide. The Italian Carnival celebrations start this week till March 5th, on the famous Fat Tuesday. Which ends all the Carnival celebrations and begins the Lent period. The origins of Carnival date back to the Roman Saturnalia festival and Dionysian feasts in Greece. A feast characterized by unrestrained enjoyment and an opportunity to upend and subvert norms. Jokes, masks, fun and good food characterize the Carnival celebrated in Alta Valle del Sele, where our family farm is located. Through the stories of our grandparents, and parents, we realized that Carnival celebrations completely changed compared to the 40s, 50s and 60s. They used to disguise themselves with old clothes found at home, the typical “mascarata”, a costume party. They used to visit especially their neighbours, with improvised camouflages – the masks were called “ciavon”. Who opened the door had to guess the identity of the person hidden under the mask and while singing, dancing and joking, especially with the seniors of the house. 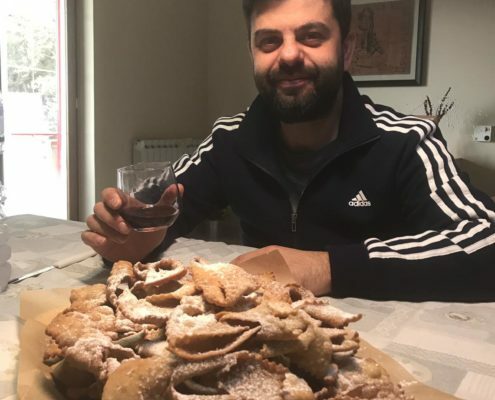 Once the identity of the “mask” was revealed, bread and sausage were offered, as well as the unfailing “Chiacchiere” fried pastries (a dough made with extra virgin olive oil). For the Fat Tuesday they prepared a soup with pork offal, fusilli with tomato sauce made with small pieces of pork meat – stuffed hen and Chiacchiere. The leftovers fusilli were not eaten the day after but they let eat them to the hens because believed that they could produce more eggs. 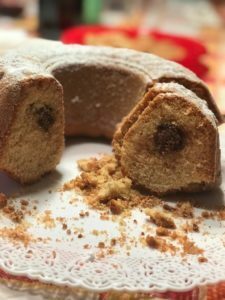 Typical sweet dessert of the Alta Valle del Sele Carnival, we want to propose here our ancient recipe. 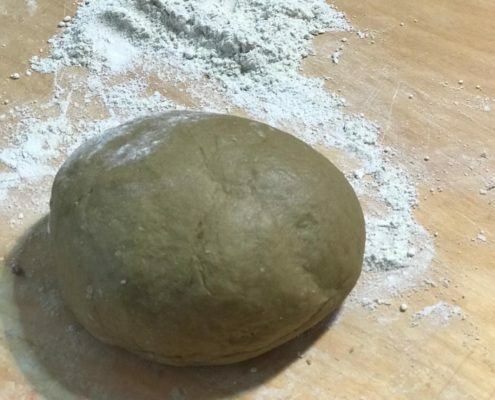 This year we prepared the dough with semi-wholemeal Risciola flour from the PiantaGrani, an ancient wheat from the Alta Valle del Sele and of course our extra virgin olive oil that we use to mix the doughs. Our extra virgin olive oil used to mix the dough. Chiacchiere on the table for the tasting. Broccoli “spiert” are the seasonal vegetables that the nature lets grow during this period. 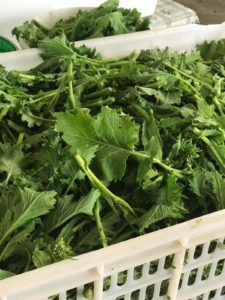 It’s a traditional broccoli ecotype that we have always cultivated in our family farm. Our grandparents, and their parents even before, cultivated them and we learned to appreciate them in traditional recipes. The term “spiert” encloses the whole meaning of this cultivation. 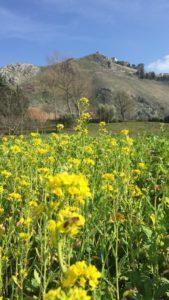 From the dialect of the Alta Valle del Sele it can be translated as spontaneous, wild to indicate that this broccoli is a natural fruit of our land. Probably at the beginning it was not cultivated, it grew naturally in the fields. Then someone decided to save the seeds and so began to cultivate it in a regular way. 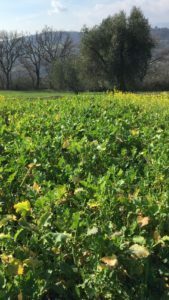 In our farm, Casa Iuorio, we decided to safeguard this broccoli ecotype from the risk of extinction and we continue cultivating it. Also to valorise the biodiversity of our geographical area. We sow it autumn in the first days of October. The harvest, handmade, starts in January and continues until beginning of April. Broccoli plants have a full-bodied central part, well protected by large and dark green leaves. We harvest only the inflorescence of this plant but also some of its softest leaves. 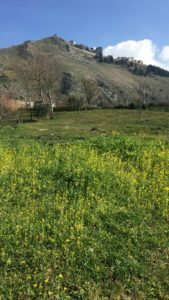 Our farm Casa Iuorio is situated in Palomonte, in the Alta Valle del Sele territory, south of the Salerno province. The valley is characterized by the river Sele, a very rich ecosystem and the Alburni Mountains, very high peaks that in this period are whitened by snow. Our fields are located in an uncontaminated landscape. Yields are prepared in open field, in full respect of the season and the environment. Our broccoli cultivated in open field. Bees on our broccoli flowers. Among the cultivation of our farm there are broccoli. We harvest them in these days and till the beginning of April respecting the seasonality of the raw material. Our broccoli belongs to a traditional ecotype of the Alta Valle del Sele called in the local dialect “spiert“, that is “spontaneous“, “wild“. A term that represents very well the natural relationship of this vegetable with the land in which we continue to grow it. It’s here that we preserve the seeds and give our contribution in respecting the local biodiversity. It is an ecotype that over time has found its ideal union with the fertile lands of the Alburni Mountains, where our fields are located. We cultivate them in open-fields, in the middle of the typical Mediterranean vegetation. 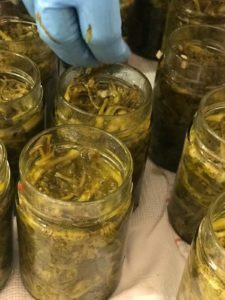 After the crop, broccoli are processed by hand and placed in the jar, ready to be tasted. Let’s see how. 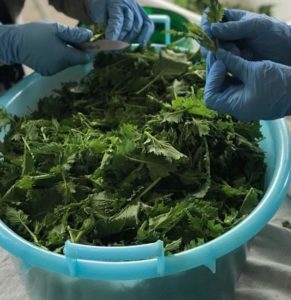 Harvested and placed in large baskets, to preserve all their freshness, broccoli are transported to the laboratory, within 24 hours of collection. Here we proceed first to select the best parts and then to wash them. The next step is the blanching in water and vinegar, then the broccoli is left to drain and cool. Broccoli are selected by choosing only the best parts. The final steps. Broccoli are placed in jars, previously sterilized, dressed with our extra virgin olive oil, garlic and hot pepper. Without the addition of dyes or preservatives. You havejust to taste and enjoy a product that has authentic and genuine scent. Extra virgin olive oil, garlic and spicy chilli ready for seasoning. The cap closes the jar and the oil is ready. 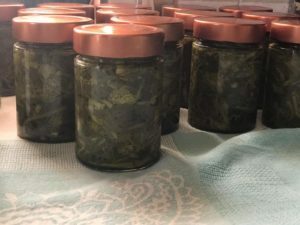 Broccoli is placed in the jars. Once opened the jar, add a little oil and keep it in the fridge. 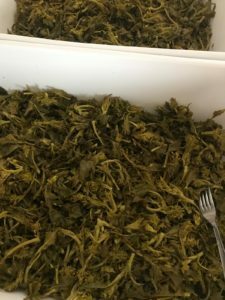 Our broccoli in oil are suitable to enrich appetizers but also for seasoning pizza or stuffing a piadina a focaccia.You can also combine it as a side dish of meat, fish and cheese. The extra virgin olive oil Colline Salernitane Dop is one of the excellent products Casa Iuorio’s pantry. Tasting it you can appreciate the distinctive notes: the colour from green to straw yellow, the strong taste, the acidity that should not exceed the 0,7%. It is an oil of superior quality, obtained in a large area, dedicated since very long time to the cultivation of olive trees. Walking through the in land areas, the vital presence of the olive groves is noticeable, also of fundamental importance for the stability of the soil. The Dop certification – Protected Designation of Origin, is an extra guarantee for the consumer, since the companies belonging to the Consortium must observe a precise production specification. Most studies traced the cultivation of olive trees to the ancient settlers of Magna Graecia. With Romans this cultivation spread even more, to become a characteristic element of the landscape of the province of Salerno. Today the Colline Salernitane Dop is produced in more than 80 villages, from Vallo di Diano to the Amalfi Coast. 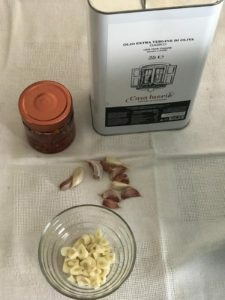 Casa Iuorio’s oil is obtained from Carpellese and Frantoio olives varieties. They are harvested by hand and pressed within 24 hours, transported to the mill in special perforated chests. 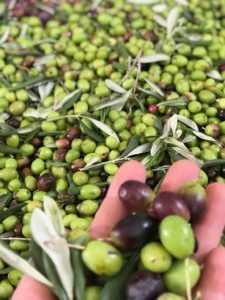 They are cold-pressed, at a temperature that doesn’t exceed 27 degrees, so we keep intact the organoleptic qualities of the olives and consequently the benefits of the oil. The acidity analysed this year in our oil is 0.3%. 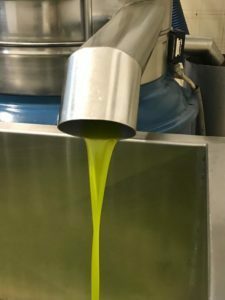 The olive juice extracted is the most faithful expression of goodness that the lands of Salerno are able to offer. 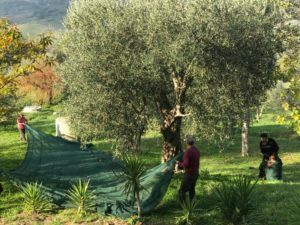 The harvest of our olives. Olives from which we get our extra virgin olive oil. The oil with the typical extra virgin color. Try it! It will be an unforgettable experience for your taste buds. The extra virgin olive oil Colline Salernitane Dop is ideal to dress salads and grilled fish but also soups and legumes. We like to recommend it in a double version to offer an healthy snack also to our children. 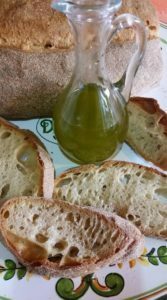 Bread and oil: it is probably the simplest and most genuine snack. 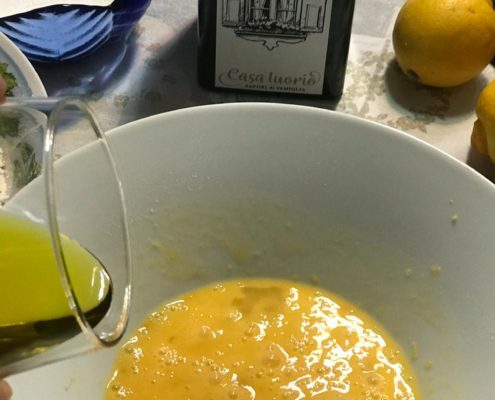 The fragrant oil meets the goodness ofthe home-made bread and also becomes an opportunity to explain to the little ones how their grandparents were having a snack, when sweets were rare and the afternoon break was almost always consumed outdoors. Home made cake: as per our family tradition, we use always oils to mix doughs for baking sweet or salty cakes. For a good snack we propose an easy and fast donut made with few ingredients but with great nutritional value. Here you are the easy recipe: 300 g of flour type 00; 150 g of sugar; 100 ml of extra virgin olive oil; 50 ml of milk; 3 eggs; lemon skin; 1 bag of baking powder for cakes. Cake dough with extra virgin olive oil. Pertosa is a small village in the caves of the National Park of Cilento, Vallo di Diano and Alburni. 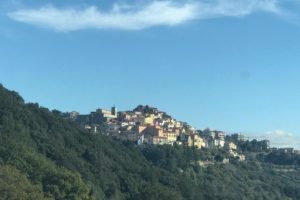 In fact, this territory in the south of Salerno, is also famous because it has become the origin of the white artichoke, a rare vegetable that identifies its name with one of the village where the cultivation was restarted. Besides Pertosa, white artichoke also grows in the neighbouring areas of Auletta, Caggiano and Salvitelle. 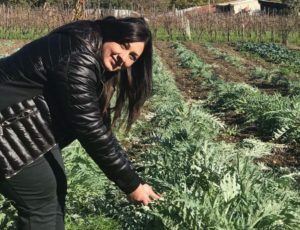 Pertosa’s white artichoke has been included in the list of traditional agri-food products of the Campania Region and subsequently it has also become a Slow Food Presidium. This indicates its important role in safeguarding local biodiversity and the task of those who have accepted the courageous challenge of continuing to cultivate it. Pertosa’s white artichoke has a very light green colour, tending to silver. It has a round shape, is large and without thorns. The heart has a particularly delicate flavour therefore is special to be tasted fresh or preserved in oil. Casa Iuorio prepares the pickles of white artichoke following a traditional recipe and using only quality ingredients: extra virgin olive oil, lemon juice and some aromas of our garden such as bay leaves, garlic and chili pepper. Because the valuable characteristics of this vegetable, we decided to grow it also in our farm. To start the first crops, we have directly selected the seeds from our trusted Pertosa’s farmers, where we went personally. Our open-fields cultivation, situated in the areas of the Alburni Mountains are particularly fertile and suitable for these crops. Waiting for the next harvest, we leave confident that nature takes its course, as it always does. A field in Pertosa with artichokes cultivation. Amid the rows of artichokes. How do you taste the oil? Tasting the oil is a true technique and has strict rules to be observed. For this reason, there are experienced tasters titled to judge the merits and defects of each type of oil. Ensure your health: even a simple cold may alter the perception of smell / flavor of the oil. In this regard, it is advisable to test the oil only in perfect health conditions. https://www.casaiuorio.it/wp-content/uploads/2017/09/assaggio.jpg 600 900 mtncompany https://www.casaiuorio.it/wp-content/uploads/2017/09/logo.png mtncompany2017-10-05 14:56:012017-10-05 15:01:21How do you taste the oil? This very precious black truffle grows underground in beechwood and oak tree forests in the Upper Sele, in the province of Salerno and precisely in the areas around Colliano to whose name it is linked, Valva and Laviano, It grows at rather high quotes starting in the 800s up to 1500 meters above the sea level, in symbiosis, with oak and beechwood trees, also with carpine, elm, maple and hazelnut trees, in soils poor of lime and rich in humus. Its dimension can change from that of walnut to a chicken egg, it has a regular shape and has a central dimple. The external part, the peridum, is black and wrinkly with medium size veins, while the internal part is of a yellowish or brownish colour with clear tinges and it has a very strong scent. It matures between October and April, when the harvest starts, the truffle are found exploiting the instinct and olphattive capacity of dogs trained in being able to sniff the truffle, research it and to respond to the truffle collector commands. The dogs with its nose to the ground, go all over the place until it can find the exact spot the tuber is. Once spotted, it starts digging and its owner who is observing every move, intervenes with a short-handle tool shaped like a pick, helping the dog dig to prevent the fruit from being ruined with the nails dog and also to avoid straining the dog. Once the truffle is extracted, the truffle collector fills the hole up again with the dugout soil; this is a very important operation for the preservation of the productive state of the truffle ground.